As 'interesting' as this thread is, it may be irrelevant as, as we all know, taste is subjective. One person's perfect blend of spices is another person's Trump. When I used to make more traditional curries, there was nothing better than dry-roasting spices and grinding them. The aroma and flavour was, and is, so fresh and rewarding. Having reached a stage in my BIR journey where I am happy with my (subjective) results, I am tempted back to more, dare I say, creative methods of producing dishes of Indian/Pakistani/Bangladeshi origin. 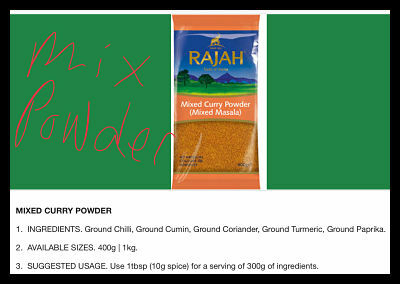 Going back to the use of commercial curry powders in BIR spice mixes, I have always avoided 'curry powders' as I have found them to be bland and 'industrial-tasting'. Why would you include, in your spice mix, another mix of spices which you could include yourself? Having said that, I contradict my own argument by using garam masala in both my spice mix and in my base. I fear self-flagellation is the only answer. I think, subjectively, that my own taste prefers the more fragrant flavours of garam masala to the, in my opinion, more bland flavour of commercial curry powders. A spice mix is a convenient way of making a quantity of ingredients which can be used to make consistently spiced dishes in haste; which is one of the hallmarks of BIR. Why would you include, in your spice mix, another mix of spices which you could include yourself? Hear hear, dear boy, hear hear. Here is a excellent example of Garam Masala use in a Bir kitchen. My understanding of garam masalas being a powerful blend not intended for generic use, but to enhance or give a individual characteristic towards the end of cooking. Skip to 2.50 if you don’t feel like viewing the entire process. I also remember chatting to the manager of my local British Indian Restaurant, living in the IOM at the time. He was quite shocked at the idea of mixing powdered spice. And insisted they buy premixed spice. Garam Masala is not included in the ingredients listing, neither is mild Madras. Yet another mix powder. Hi Andy, yep the hotter the better sounds good to me. But I do believe they come in differing strengths of heat. So I’m guessing they’re probably equal quantities mixed, however I’m only guessing at this . One thing is for sure then I will purchase some and give it a bash, the mix of spices sound similar to my preferences. I tried Rajah's mixed masala some time ago, but didn't find it very inspiring. The majority went in the bin. I am afraid that with the sole exception of Bassar curry masala, almost all of the pre-mixed spice blends that I have tried (Kitchen King, Patak's mixed masala, Mehran chicken/lamb masala, ...) have proved a major disappointment, which is (yet another) reason why I prefer to add individual spices in the quantities and proportions appropriate to each dish. Morning Phil, yes I believe the method you use is probably unbeatable, also infusing each dish with individual characteristics. My Guess is Haldi was probably correct in his observation with this post. This was my experience previously mentioned using CT pressure base, I found the double up of Garam masala a bit much for my own preference. Combined with a mix powder containing additional Garam masala used in the curry stage. I’m going to try and cook using only CT base next week using a non GM mixed powder to see if it’s more to my taste. Some gravy called for the addition of boiling Whole masala spice to extract flavour, something I have not tried in my journey. Difference between boiling or frying Garam masala in bas gravy? Anyone? Serious use of GM in universal gravy. Just to be clear I’m not knocking anyones gravy, but given my own opinion and discussing the subject of Garam masala in base gravy and mix powder. Everyone has a different regional preference where bir is involved and I’m not saying my opinion is worth anything. I’m aware Viceroy Abbots base was not high rated when open for business, I believe a member had eaten at the Bir and not been so impressed. However I rate the gravy and like the evenness of this flavour on the palate, combined with their mix powder I find nothing overpowering in the final product. This is something important for me in a good British India curry, if we could distinguish individual flavour from bir then we would have no trouble replicating it. Anyone that tries my recipes, this is the mix powder i use. How did i get to this blend? i had my chef friend look at what i was using, then he tweaked it. One thing he did was to take out the garam massla and i asked why? he said you already have the garam massla ingredients in there. I asked why do you use ready made curry powder (mild madras)? answer: it is one less job to do and as every thing he wants in it. Difference between boiling or frying Garam masala in bas gravy? If there is no oil at all in the base, then I think that any flavours that leached out from the garam masala would still be effectively raw. I also think that in the absence of any oil, far less flavour would leach out from the spices than if oil were present. ** Phil (just enjoying a good 6-Puttonyos Tokaj before bed ...). I made a happy find in my local spice shop. It is run by the same family that runs the local BIR. they sell their own mix powder in 300g takaway containers - no need to mix my own when I can use the 'real thing'. Smells lovely.